On undeserved forgiveness and global warming. 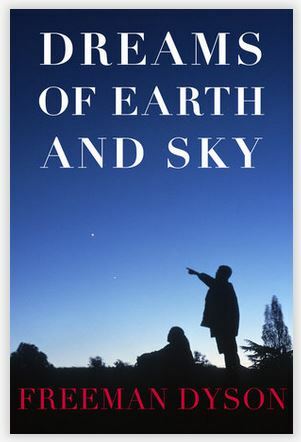 I wish there were more essays focused on philosophy in Freeman Dyson’s collection Dreams of Earth and Sky. I thought all his remarks on morals and philosophy were nuanced and compelling. His essay “Rocket Man,” for instance, is very powerful. This essay discusses Wernher von Braun, a German scientist who helped develop Nazi weaponry during WW2 and was later hired by the government of the United States for our space program. Many people felt betrayed that the U.S. would hire Von Braun after his participation in evil. He aided in the war effort, sure, but more damningly he knew about and did not resist Nazi atrocities — slave labor under brutal conditions was used for the program he led. And yet, after the war ended, he was allowed to pursue his dream of launching humankind into space. Dyson, in articulating his philosophical stance, describes his own contribution to atrocity during that conflict: the bombing of civilian Dresden. To me, this acknowledgement of personal culpability lends a lot of power to his reasoning. He knows that, if Germany had won the war, it could’ve been him rather than Von Braun who was condemned as a war criminal. One of the t-shirts I rotate through while volunteering with the local running teams is an Amnesty International shirt given to me by my sister. It has the text an eye for an eye leaves the whole world blind along with a cartoon schematic of two faces with an x-ed out eye each that overlap Venn-diagram-style to yield a fully-blind Earth. So, sure, I’m predisposed toward excessive mercy. I do realize that the human brain is wired to desire vengeance: seeing bad behavior punished helps us resolve lingering malaise, especially when the initial bad actions were perpetrated against ourselves or those we love. But it’s hard, the idea of balancing retribution and forgiveness. I’ll write more about my own conflicting views on vengeance when I finally type out an essay on Jon Krakauer’s Missoula — despite my hippie-esque views on the potential for rehabilitation and redemption, the way Krakauer’s book is written it’s hard not to root for the perpetrator in the book’s central case to receive the harsh punishment that the victim’s family is pushing for (I know, I know… I already posted an essay about Missoula and didn’t discuss this at all. It’s always difficult knowing how many bleak thoughts I can cram into a piece before it becomes unreadable). Or, from more recent developments in the news — even though I’m a runner, and with numerous marathoners amongst my friends and family, I don’t feel good about the mentally-ill kid being condemned to death (I suppose this isn’t recent anymore, not by the time this will be posted. And it’s odd for me, re-reading this now — a lot of people are upset that major news outlets have speculated about the sanity of the terrorist who murdered all those people in South Carolina but didn’t extend the same doubts to the terrorist who murdered & maimed all those people in Boston. Whereas I think it’s pretty clear that perpetrators of both crimes were not getting the psychological support they needed). My main objections to the death penalty are related to the fact that our judicial system is so broken. Coerced confessions and planted evidence have been used to condemn many innocent people to death [http://www.innocenceproject.org/]. That’s not the case here — the kid is guilty. The magnitude of suffering he inflicted means he should probably never be set free. But I think you could reasonably argue that life imprisonment would be more effective deterrence against further terrorism than the death penalty / martyrdom. The death penalty ensures that the case will return to national prominence at least one more time [http://www.bostonglobe.com/metro/2015/04/16/end-anguish-drop-death-penalty/ocQLejp8H2vesDavItHIEN/story.html]. And I think there’s something to be said for rising above the brutality of others. But even though I enjoyed the philosophical essays in Dyson’s book, and always enjoy personal narratives from scientists who were friends and colleagues with the founders of quantum mechanics, the essays grounded in biology often seemed strange to me. I wrote previously about my nonplussed reaction to Dyson’s comments on plants, photosynthesis, and evolution. The points he raises in his essay “The Question of Global Warming” seemed equally confusing. 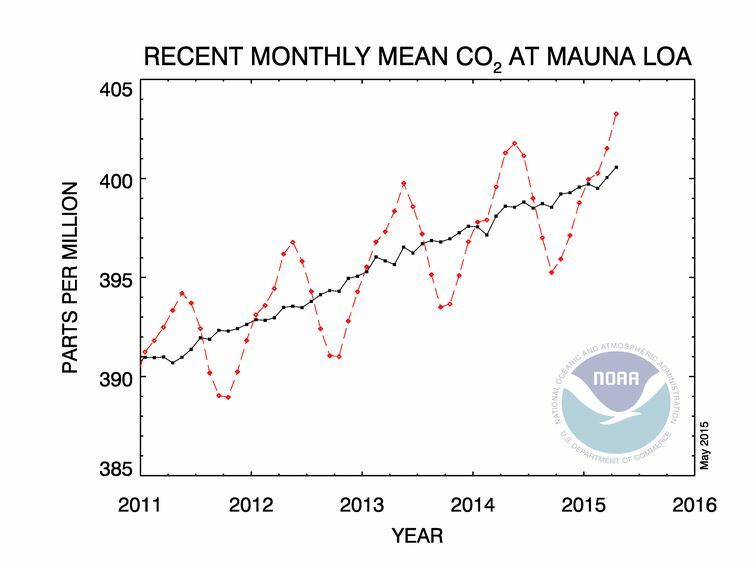 Graph of recent carbon dioxide averages. See more at the ESRL home page. The basic issue is this: Dyson presents a graph from the National Oceanic & Atmospheric Administration that shows atmospheric carbon dioxide versus time. There’s an overall positive slope, and that’s what everyone thinks is bad, but there are also annual wiggles up and down. Dyson interprets these wiggles as indicating that plant growth each year (primarily during spring and summer) takes up approximately 5-10 ppm of carbon dioxide per year, and then plant decomposition (in fall and winter) releases most of that back into the atmosphere. Dyson then uses these numbers to approximate a residence time for any one molecule of carbon dioxide in the atmosphere — since this is a random process, the most sensible measure to use is the half-life, the length of time at which there is a 50% chance that our chosen molecule has been incorporated into a plant. The number he comes up with is 12 years, which sounds very low. Even if you make very generous assumptions, like 10 ppm being taken up each year, selected from a total of 300 ppm, you’ll get a half-life equal to [ log (0.5) / log ( 29 / 30 ) ], which is over 20 years. The first is about math: is half-life is still a useful number to measure under this regime? If you’re hoovering up carbon dioxide, wouldn’t you rather deal with the arithmetic number that tells you how many years it will take to get atmospheric levels down to where you want them? In other words, just measure how much needs to go away, how much you can get rid of per year, and divide the two. Who would care about the identities of each particular molecule if you were solving the problem that way? And my second objection is related to ecology: even if you develop one or more fancy new varietals of carbon-trapping plants, why would you postulate no replacement of atmospheric carbon dioxide? Unless the plan is to raze all our existing plantlife, bury it, and replace everything with the new species (even though I’m pro-GM plants, this sounds a bit unwise to me), every winter will bring more rot. Our old plants will behave the same. While I appreciate Dyson’s point that global warming is a very complicated question, and that it’s extremely upsetting for a trained scientist to hear dogmatic claims about deadlines and thresholds when it’s clear that atmospheric science is sufficiently complex that no one really understands what is or will be happening, I think he does these nuanced views a disservice by pairing them with concretely-stated, specious biological claims of his own. Yes, global warming is not well understood. Yes, economic discounting (valuing a cost you have to pay now to fix something more highly than a cost you’d have to pay later) is appropriate to use: we might have fancy new technologies to help us by then, or might have triggered a new international conflict that kills us all. Discounting is an appropriate mathematical tool to help us plan for uncertainty. But I would have been much happier to see Dyson make these points without invoking seemingly-unworkable schemes, because I think the strange details distract from a lot of the really good philosophical points he makes. On racism and the empathy gap (while sneakily building toward the idea that teaching kids to root for your favorite sports team might be kinda evil).